As a society, it seems that we sure don’t agree on much these days. Actually, about the only thing we might agree on is that something is not right with the world. The broken world we see on the news, streaming through our social media feeds, or in the lives of those closest to us hammers home one key truth: somewhere at some time in our long history, something has gone horribly, tragically wrong. The lies of unbelief, idolatry, and rebellion were first believed by Adam and Eve and now bubble up from every human heart. They are everywhere in our culture. It has become almost an assumed dogma that to “follow your heart” is the best path to happiness and freedom. But Scripture shows that those who follow their heart, apart from the transforming work of the Holy Spirit, are actually following the voice of Satan. The sin of the first couple had devastating consequences for Adam and Eve, and it does for us as well. The Creator God handed down His punishments to the serpent, the woman, and the man for their part in this sin, and we bear those same consequences today, both for their sin and for our own. Sin has wrecked and ruptured our created purpose to rule over God’s creation and steward it for His glory and the good of others. The consequences of sin are severe, but from the first moment of sin, God also responded with a message of hope to His people. When you read through Genesis 1–2 for the first time, the final verse of these chapters might seem rather odd: “Both the man and his wife were naked, yet felt no shame” (Gen. 2:25). Adam and Eve were naked and unashamed. Why would God include that detail—one that is prone to make us blush? We find the answer seven verses later. After Adam and Eve sinned, their eyes were opened and they knew they were both naked, so in shame, they sewed fig leaves together to cover themselves. These two verses work together, as bookends to the first sin. The first verse shows God’s intention for Adam and Eve. They were to enjoy complete intimacy and acceptance of one another in marriage. There were no barriers between them. The second verse shows sin’s immediate and devastating consequences. What God had intended for Adam and Eve to enjoy was lost. Intimacy and acceptance gave way to barriers and shame. Our blushing reminds us of what was lost. Just reading of Adam and Eve’s nakedness makes us uncomfortable. Deep down, when we read Genesis 2:25, we feel what the first couple didn’t feel in that moment—shame—revealing how deeply sin has affected us. And just like Adam and Eve in Genesis 3:7, we do all we can to cover our shame from one another and from God. Adam and Eve disobeyed God, ate from a tree, and died. Jesus willingly obeyed God by being nailed to a tree to die for us. He took the bite of the serpent and the poison of the curse so that we could be released from both. And in doing so, Jesus crushed the serpent’s head (Gen. 3:15). This article was adapted from The Gospel Project for Adults Fall 2018, Unit 1, Session 3—“Sin and God’s Good News.” Join us in “The Beginning” this fall as The Gospel Project start a new three-year chronological, Christ-centered journey through the storyline of Scripture. Preview four sessions free at gospelproject.com. Jesus calls people from all backgrounds and every imaginable way of life. Anyone who responds to His call will be saved and assured of a place in the family of God. If you were picking a team of people to help you change the world, what types of people would you want? Why? Zebedee their father, preparing their nets, and he called them. 22 Immediately they left the boat and their father and followed him. Jesus didn’t choose celebrities with money and influence. He didn’t choose politicians with connections or CEOs of Fortune 500 companies with excellent leadership and managerial traits. Instead, He chose two sets of brothers who were all fishermen. The first set (Peter and Andrew) were everyday blue-collar workers. The second set (James and John) worked for their father, who had hired help (see Mark 1:20), so they may have come from some level of affluence. In His call, Jesus used a play-on-words when He took their occupation (fishermen) and turned it around, saying He would make them “fish for people.” What’s amazing is that both sets of brothers immediately followed Jesus when He called them. They didn’t have all the details, they didn’t have a destination in mind, but still they obeyed Jesus’ call to follow. Like Abraham, who left his family and country to go to a place promised by God, and like Samuel, who said, “Speak, for your servant is listening” (1 Sam. 3:10), the disciples followed in the footsteps of their faithful ancestors and heeded God’s call. God when He called them? Today, Jesus is calling people from every walk of life to leave their selfish pursuits and follow Him. It takes wisdom to understand the nature of God’s particular call on your life. It may not require that you walk away from your family business or sell all your belongings. But it will definitely require you to give up the idea that you command your own destiny. It will mean you give up any trace of selfish ambition that affects your life decisions. God’s kingdom must be first. As we submit to God, He does amazing things through us. The beauty of God’s call to repentance is that He brings together people from various backgrounds and groups in order to highlight His glorious work of redemption. He calls people you’d least expect. He does things you would never predict. He doesn’t just call “the cream of the crop” to be His spokespeople but unlikely people whose life-change will demonstrate the glory of His work. Why is it both comforting and empowering for believers to know and understand that God calls everyday, ordinary people to proclaim His extraordinary gospel? This was an excerpt from D.A Horton, The Gospel Project: God Among Us © 2018 LifeWay Press®. Used by permission. Scripture quotations are taken from the Christian Standard Bible®. Copyright 2018 by Holman Bible Publishers. Used by permission. Know The Story: Two years passed since Peter and Andrew first met Jesus. For the first year and a half, they followed Jesus at a distance, exploring His claims and coming to the conviction that Jesus was the Christ, the Son of God (see Matt. 16:16). Then they answered His called to “follow Him” and become fishers of people. During the next several months Peter, Andrew, James and John shadowed Jesus, watching Him do miracles, heal the sick, cast out demons, and confront the religious establishment of the day. They were on a steep learning curve for sure! But now Jesus was raising the stakes again. Two years into His ministry, the movement was growing so rapidly that Jesus needed to identify and train a few disciples who would lead the movement once He was gone. He spent all night in prayer, asking the Father for wisdom as He selected these disciples. Then He chose 12. Jesus would train these disciples for the next year and a half. Eventually, they would take the gospel to the ends of the earth. 13 Jesus went up to the mountain and summoned those he wanted, and they came with him. 14 He appointed twelve, whom he also named apostles, to be with him, to send them out to preach, 15 and to have authority to drive out demons. 16 He appointed the Twelve: To Simon, he gave the name Peter; 17 and to James the son of Zebede, and to his brother John, he gave the name “Boanerges” (that is, “Sons of Thunder”); 18 Andrew; Philip and Bartholomew; Matthew and Thomas; James the son of Alphaeus, and Thaddaeus; Simon the Zealot, 19 and Judas Iscariot, who also betrayed him. Based on these verses, what qualities do you think Jesus was looking for in these disciples? What does it mean to be “with” Jesus? To be send out by Him? Jesus hand-selected these disciples to be leaders. They were an interesting group to say the least. None were wealthy, highly educated, powerful, or from the ranks of the religious elite. In fact, the opposite is true. Most were hard-working laborers, others were political zealots, one was a dishonest tax collector, and still others were small-town nobodies. These uneducated, common men were transformed by Jesus. That should bring us a lot of comfort. Jesus loves using common, ordinary people to do uncommon, extraordinary things! Being a follower of Christ doesn’t mean we always do extraordinary things for God. What are some ordinary things a follower of Christ can do to advance the Kingdom? David rose from obscurity to prominence through the work of God, who took him from leading sheep to leading an entire nation. In 2 Samuel 7 David expressed his desire to build a temple for God. God’s desire, however, was to establish a dynasty, a house of rulers to sit on the throne of Israel for generations to come. The Lord fulfilled His promise, both literally and spiritually. Spiritually speaking, the house of David still exists today in the person of Jesus Christ, who rules over all things and will one day return to inaugurate His eternal kingdom. From this remarkable account, believers today can learn several truths about the way God fulfills His purposes in and through our lives. In response to David’s desire to build a temple, God made it clear that He had much greater plans. Ironically, while David wanted to build a house where God could dwell, the Lord already had a dwelling through which He worked—David himself. God’s purpose and promise were to make a name for David (see 2 Sam. 7:8-9). The word for ruler in verse 8 is sometimes translated prince. In this way David was reminded that the Lord was the true King of Israel. His was the unseen hand of power, and God wanted David to remember that the Lord had established him. When we put our confidence in what the Lord has done for us, not in what we’ve done for ourselves, we align ourselves with His purposes. Under David’s rule God promised to give the people rest from all of their enemies (see 2 Sam. 7:10-11). This was the golden era in Israel’s history because the Lord’s blessing was on David’s leadership. It would turn out to be transitory because of human sinfulness, but it nevertheless served a great purpose. The rest that the people enjoyed under David (see v. 1) painted a picture of a future perfect era of tranquility and security grounded in God’s mercy (see Jer. 31:1-9). The Lord’s message to David included a description of what would take place after David’s death (see 2 Sam. 7:12). The Lord promised that He would raise up one of David’s descendants to rule in his place after his death. In the New Testament both Peter and Paul saw in this verse a messianic foretelling of Jesus’ resurrection (see Acts 2:30; 13:23). The early church understood this descendant of David to be Jesus, whose followers trusted in Him as the Messiah of God. The kingdom of Solomon would be the immediate fulfillment of God’s promise in 2 Samuel 7:13-17, but Jesus would be its ultimate fulfillment (see Ps. 89:29-37). The One greater than Solomon (see Matt. 12:42) reigns forever because God has established His kingdom (see Heb. 1:8). The “faithful love” (2 Sam 7:15) of the Lord would continue with David’s descendants in spite of their sinfulness and disobedience. God always brings to pass what He promises. We live by promises, not explanations. David could have only partially grasped how this would come to fruition. He had to take God at His word by faith. How much more should we, then, on the opposite side of the cross, do likewise? Second Samuel 7:18-21 records that David was overwhelmed by the revelation God gave him about establishing his kingdom. This amazement was heightened by God’s knowledge of David’s shortcomings and propensity for sin. The same is true of each one of us. The One who knows us best loves us most. The only appropriate response to this amazing truth is humble thanksgiving to the Most High God for all His blessings, the greatest of these being deliverance from and forgiveness of sin. By His grace God has established us in His kingdom. A response of humility, courage, and obedience allows us to join His purposes in the world. This article is an excerpt from the Bible study Explore the Bible: 2 Samuel, Chapters 1–12 by Jason K. Allen. Scripture quotations are taken from the Christian Standard Bible®, Copyright © 2017 by Holman Bible Publishers®. Used by permission. Christian Standard Bible® and CSB® are federally registered trademarks of Holman Bible Publishers. The phone that used to be in my office had a red light that blinked with every new voicemail. It was annoying, but I had no idea how to turn it off. My solution? I put a piece of tape over the blinking light. That phone has long since been replaced with a cell phone, but now I am bombarded with constant notifications about messages, texts, and tweets. Heaven doesn’t have a message machine with a blinking red light. Sometimes we may wonder if God hears our prayers, but we have no “message read” notification on our phones when it comes to prayer. Neither does prayer usually offer the same “instant gratification” we often get from social media notifications—but what it accomplishes is phenomenal! Prayer can be a mysterious spiritual discipline, but God invites us to talk to Him! Nehemiah was a man who saw the need for prayer and realized its benefits. He knew prayer is more than just simply sending messages to God. Prayer is a spiritual endeavor that brings us into communion with God, focusing on His truth and leading us into action. The Book of Nehemiah begins with bad news. Hanani brought Nehemiah a message he didn’t want to hear. The few people left in Jerusalem were in trouble, and the city was in ruins. The news consumed Nehemiah. He was living in relative comfort in “the fortress city of Susa,” a place of safety and comfort. It was the winter residence of Persian kings, and Nehemiah was there personally serving King Artaxerxes. In contrast to Nehemiah’s daily life, the remnant of people in Jerusalem was in trouble. The city was devastated, like a scene out of an apocalyptic movie. Buildings and homes were abandoned, but worse, the city wall had been broken down and its gates had been burned. Furthermore, over the years, looters had surely taken what few valuables may have been left by the Babylonians. But what could Nehemiah do? He was living hundreds of miles away. He visualized the damage, and then he internalized it. Surely the words in verse 3 echoed as he heard them: “Great trouble and disgrace … broken down … burned.” In the next verses, we’ll see how this news moved Nehemiah to pray, but let’s notice that he was able to pray effectively as he became aware of the specific need. We can pray effectively, too, as we take note of the needs around us. Ask specific questions; don’t assume. We often miss this step. In verse 2, Nehemiah asked a specific question about the people and the city he loved. In order to understand the problems around us, we must first ask. We’re often guilty of making assumptions about other people and their problems without ever asking or learning the facts. Making assumptions does not reveal the true needs around us. Take the time to ask. Listen carefully; don’t jump to conclusions. After asking the question, listen. Don’t jump to conclusions. Drawing conclusions before listening is just as dangerous as making assumptions before asking. Nehemiah listened carefully as his brother shared the news. Personally, I would have been tempted to jump in and start offering solutions, giving my premature opinion on the matter. In order to become aware of the needs around us, we must listen without making immediate conclusions. What helps you become aware of the needs around you? This article is an excerpt from Nehemiah: Building a Life of Service, a six-session study in the Summer 2018 Bible Studies for Life. 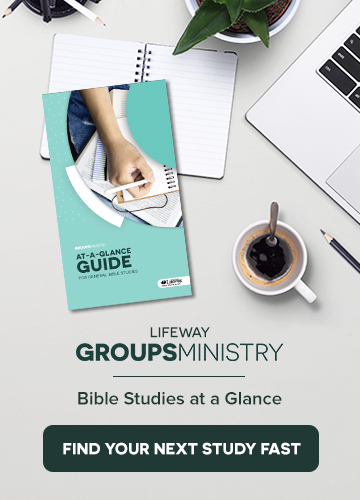 Learn more about this ongoing curriculum and preview one month for free at biblestudiesforlife.com. If you grew up in church, the term “Call to Worship” or “Invocation” may be familiar to you. It’s the part of the worship service—usually a prayer, Scripture passage, or song—that asks the Lord to be present with the people, and calls the people to worship the Lord who is present among them. We all experience different seasons in life. Sometimes worship comes naturally, and sometimes it’s a struggle. Yet, what we learn in Psalm 107 is that the call to worship is ever-present. God is always ready and waiting for us, just as we are. Psalm 107:1-3 speaks of God’s character and actions on our behalf as reasons to worship Him. At the time this psalm was written, the psalmist didn’t know exactly how God would ultimately redeem His people from trouble and gather them to Himself, only that He would. Our call to worship is predicated on the character of God. No matter what our circumstances, He is eternally good, faithful, loving, and true (v. 1). In the death and resurrection of Jesus Christ, He has redeemed us from the enemy of our souls and draws us to Himself (vv. 2-3). Jesus doesn’t wait for us to pull it all together, but meets us exactly at the places where we’re looking for fulfillment. We all have our desert seasons and they’re all different. You may experience more than one desert season in your life, and each one will look different from the others. Some common characteristics of desert seasons are loneliness, longing, and lament. Though the causes and symptoms of our dryness may be different, the answer in every one of them is the same. After God delivered them out of Egypt, Israel wandered in desert wastelands for 40 years, captive to their sins. They were hungry, thirsty, and had no direction to find a place where they could settle. Today, God’s people are still prone to seasons of wandering. Though we have been given numerous examples in Scripture of those who needed to turn to God in their season of wandering, we often think we know a better way. The fight of faith in our lives is a continual battle against the lies that would have us believe we can direct our lives better than God. The only true end of aimless wandering in this life is returning to God. In order to cry out, we have to first realize that we are not okay. We are poor, needy, and cannot find our own way out. Admitting we are poor and needy isn’t always comfortable, but it’s necessary. It’s okay to not be okay. It’s not okay to stay there. We must be willing to be led out of the desert. It’s not something our culture likes to hear, but there is only one right path and it is the way of the Lord. When we acknowledge our need and turn to Him, He satisfies our thirst and fills us with good things. He fills our loneliness with His loving presence. He gives new direction to our longing, changing our desires from the things of earth to His everlasting kingdom. He turns our lament into thankfulness and joy. This is an excerpt from Lauren Chandler’s small group study, Steadfast Love Session 1 & 2. Series and study are available exclusively at smallgroup.com. As we continue our journey through the depths, clefts, and mountaintops that make up God’s kingdom, let’s broaden our road map by looking more deeply at this overarching concept of God’s kingdom. The Greek word the Bible uses for kingdom means “rule” or “authority.” Thus, when we talk about a kingdom, we’re talking first about a king or a ruler. We’re talking about someone who’s in charge. If there’s a ruler, there also have to be “rulees,” or kingdom subjects. In addition, a kingdom includes a realm—a domain over which the king rules. Finally, if there are a ruler, rulees, and a realm, there also have to be kingdom regulations— guidelines that govern the relationship between the ruler and the subjects. These are necessary so that the rulees will know whether they’re doing what the ruler wants them to do. God’s kingdom includes all of these elements. He’s the absolute Ruler of His domain, which encompasses all of creation. Everything God rules, He runs— even when it doesn’t look as if He’s running it. Even when life looks as if it’s out of control, God is running its out-of-controlness. God’s kingdom also has rulees. Colossians 1:13 says everybody who has trusted the Lord Jesus Christ as Savior has been transferred from the kingdom of darkness to the kingdom of light. If you’re a believer in Jesus Christ, your allegiance has changed. You no longer align yourself with Satan but with Christ. 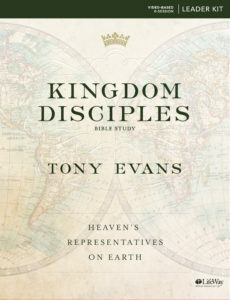 This was an excerpt from from Kingdom Disciples: Heaven’s Representatives on Earth by Tony Evans. Published by LifeWay Press®. © 2018 Tony Evans. Used by permission. In the early days of His public ministry, Jesus intentionally gathered a number of disciples around Him. As was the custom of rabbis in those days, Jesus intended for these young men to follow Him during His travels in order to both learn from Him and contribute to His ministry. The following story shows how Jesus called two of those first disciples. 43 The next day Jesus decided to leave for Galilee. He found Philip and told him, “Follow me.” 44 Now Philip was from Bethsaida, the hometown of Andrew and Peter. 45 Philip found Nathanael and told him, “We have found the one Moses wrote about in the law (and so did the prophets): Jesus the son of Joseph, from Nazareth.” 46 “Can anything good come out of Nazareth? ” Nathanael asked him. “Come and see,” Philip answered. What do these verses teach us about following Jesus? How would you summarize the process through which Nathanael became a disciple? The first step in becoming a disciple of Jesus is encountering Him in a deep and meaningful way. Nobody inherits a relationship with Jesus from their parents. Nobody earns their status as a disciple by attending church, doing good things, or avoiding bad things. We become disciples of Christ when we experience Him in a way that changes our lives. How has your life been changed by an encounter with Jesus? All of this tells us there’s no template for receiving the call to follow Jesus. There are no magic words you have to say and no amount of steps you must follow in order to officially be considered a Christian. Instead, followers of Jesus are simply those who respond to His call. “For it was you who created my inward parts; you knit me together in my mother’s womb. I will praise you because I have been remarkably and wondrously made. Your works are wondrous, and I know this very well. My bones were not hidden from you when I was made in secret, when I was formed in the depths of the earth. Your eyes saw me when I was formless; all my days were written in your book and planned before a single one of them began” (Ps. 139:13-16). God also created us—and He created us in His own image (Gen. 1:26-27). You and I were made by God, in the image of God, for the purpose of glorifying God. People are created as either male or female, in all shapes and sizes, with different appearances, and a wide variety of ethnicities. But God didn’t create us to look like Him physically. He created us to be like Him spiritually. And that is remarkable! Wondrously made. God created every person walking the face of the earth as a unique individual, distinct and set apart. The intricacies of the human body and the amazing ways our physical bodies move and function are wondrous in themselves. But God also made each one of us unique. David praised God for the wonderful and special way He created us. That doesn’t mean we were born perfect according to the world’s standards. We can rest assured that, no matter what flaws, ailments, or challenges we may have, God loves us—and has a purpose for us. There’s no greater value than being known and loved by God—and God knew us and loved us before we were ever born! Where in our culture do we see life being devalued or disrespected? What actions can we take that reflect our belief in the value of all human life? Your life matters. Let that truth make a difference in your life this week. Commit Psalm 139:13-14 to memory. Let these verses take hold in your mind and heart, so that it not only impacts how you see yourself but how you see those around you. Excerpted from Jordan Easley, Bible Studies for Life: Made for Something More © 2018 LifeWay Press®. Used by permission. Scripture quotations are taken from the Christian Standard Bible®. Copyright 2018 by Holman Bible Publishers. Used by permission.